It Takes Just 6 Seconds For Stealing Bikes! Shocking Video! Everyone would think that with the major progress that we have had over the past couple of years in the vehicle industry that stealing one would be a massive problem, right? Well, this video is surely going to prove something else, something that none of had expected so far. Namely, in this short clip we see how easy stealing bikes actually is, as it takes just under 6 seconds. You are not going to need much, just a single piece of wire that is going to do all the work. You can power the bike up just with a simple piece of wire. Yes, that is actually true. It takes nothing more than just metal and an experienced hand to do all the work. 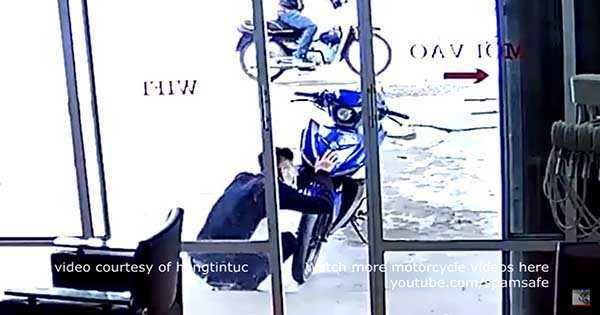 In the short clip in this video we see how the thieves do the stealing bikes thing from the owner`s shop. In just matter of seconds they are off and even though the owner tried to run after them, he could not anything at all. Moreover, in the video we actually see the method that these thieves use. It is utterly simple and anyone can do it. All you are going to have to do is to find the ignition key located under the bike and simply connect the positive and the negative together. What do you think, what could the owner do if they want to keep their bikes safe and away from the hands of these thieves? Bycicles are target of theft as well, read the rates!